Are we not living in an amazing time? Technologically advanced, digitally sound! We thrive on all things digital. The world around us is becoming all digital with limitless possibilities. Today as a consumer, you can preorder your coffee, interact with augmented reality in the store, and skip the lines at store with alternative payment methods. To cut the story short, as a consumer, we have access to unlimited goods and services and connected around us. And mobile is at the center of all this change. It’s the tool that is bridging the gap between the digital and physical. And the availability of 5 million apps come as a proof of this explosion. In the first quarter of 2018, Apple had 2 million apps on App store. As of the same quarter, Android users were able to choose between 3.8 million apps. More and more businesses are adopting Mobile Apps as their primary channel for business growth. This explosion proves that mobile is at the core of customer experience. Before moving further into the topic, you can watch the entire webinar here or else you can skip the video and continue reading to get the gist of the webinar. As a business mobile Apps are not just another channel. More and more organization are realizing that it can be a means to create awesome customer experiences. There are numerous examples to illustrate. One such example is Starbucks. The secret to Starbucks’ app’s success is that it gives users an intuitive experience, making it as easy to find a store, order your coffee and make a payment through their wallet. Recently, Starbucks has also taken the mobile app experience one step further with an innovative conversational ordering system powered by Artificial Intelligence (AI). The explosion in mobile apps imply to speed. How quickly you can make a change and let the customer experience it? The mathematics of velocity matter here. Market speed has left companies with a simple problem: How do we go faster than we ever have before, without losing an eye on quality? It is an amazing fact that Facebook mobile app is updated and refreshed every two weeks like clockwork. That’s the new normal. We will talk about this example in detail a little later in the webinar. So in order to gain Quality@Speed, we reach to a point where experience and quality intersect and we name this convergence Quality@Speed. It’s a no brainer to say that Quality @ speed can be achieved with two fundamental principles. Agile: Agility allows teams to work closely with business and it Pulls quality forward. It’s also called Shift Left of Quality. You are delivering small chunks to end consumers on weekly or monthly basis. This allows teams to get feedback early on. DevOps: DevOps brings you speed. It’s a Shift left of operations. 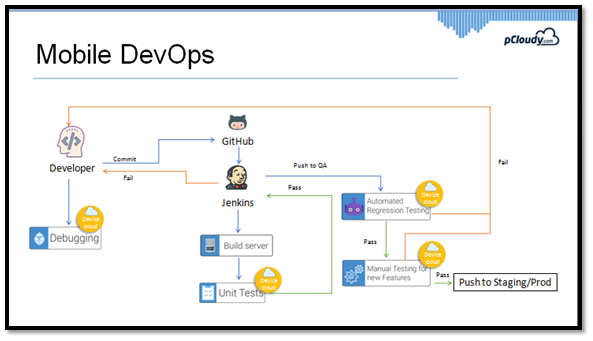 DevOps practices allow you to create “ready to deploy code” on demand. In other words, it means deploying software and the environment on which it runs, automatically and on demand, at any stage of the software delivery lifecycle. You can truly have multiple deployment in a day. If we dig deeper, DevOps is enabled by two practices Continuous Integration and Continuous Delivery. These two will not work in sync until you have continuous testing in place. It’s also proven by many independent studies. Here, we have a look at the data extracted from World Quality report, 2017-18 showcasing the popular and the best practices followed in DevOps. 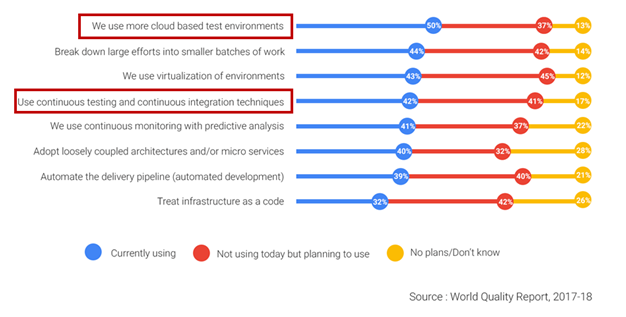 If we have a closer look at the data, we will find that 87% of CIOs and senior tech professionals use or are planning to use cloud based test environment. Depending on choice of organization, it could a Private or public cloud but it’s a must to achieve speed. Second data point is about Continuous Testing, here as well more than 80% of respondents chose this as a preferred DevOps practice. Facebook follows Ship early and Ship often approach. They update their web app multiple times a day while their Mobile Apps with frequency of almost 2 weeks. This is possible with DevOps best practices they have been following from past few years. If we analyze their DevOps story in short, we find that one of the biggest takeaway for Mobile Teams is their massive investment in device infrastructure. Every time they make a change to app, it gets tested on 2000 real devices. Imagine 2000 real devices! They have bypassed use of simulators/emulators. 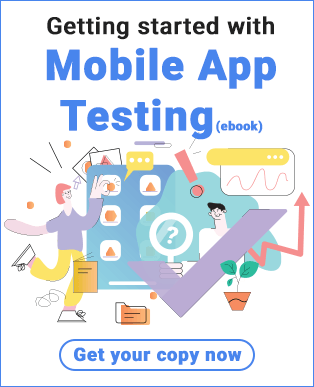 Now let us move on to have a look at some of the Mobile DevOps challenges that comes as an obstacle on the way of mobility teams. Mobile apps have multi environmental target. Mobile apps have to deal with device fragmentation as they need to be workable on multiple devices. This poses a test for Ops team to build an optimal device infrastructure. Moreover, it is difficult to keep pace with the ever changing device requirements. serves as a front end to enterprise mobility already in use by the firm, such as transaction processing systems, employee HR systems, or customer acquisition systems. This implies that the mobile app, available on multiple platforms as a native or Mobile Web app, needs to be built and delivered aligned with the backend services. The biggest challenge for DevOps is to think about enterprise mobility holistically and manage their build and release processes and cycles. Since apps today are supported on multiple platforms, numerous different builds of the app has to be triggered each time when a change is being deployed by a developer. The build system and configuration for each supported mobile environment is dissimilar from the others. You will probably require a small farm of build servers to be provisioned and available to manage these multiple operating system builds. Let’s try to depict the Mobile DevOps cycle. Some of the tools mentioned here are a representative set of tools in the respective category. It starts with a Dev checking in a code to Git/Versioning system. That triggers the CI server to build the App which could be Internal build server or a cloud system like Circle CI. Once the build is successful, Unit tests are runs on Real devices. If the Tests are pass, build is pushed to QA Env. Where Automated regression tests are triggered on real devices. If that’s a pass App compatibility tests for new features are done. 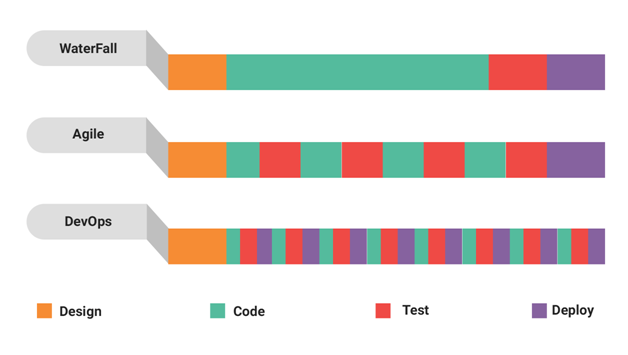 We’ve by now witnessed quite a journey to reach Continuous Testing. “Classical” testing was intended for software delivery cycles spanning months or year. Agile has changed this norm to a 2-week development iterations—but now something extra is required to meet today’s insatiable demand for software. Attempts to fasten the process further, created a chasm between Development, Test, and Operations. That gap has been bridged with DevOps and Continuous Testing in order to move beyond that speeding up plateau. However, when we look into the future, it’s clear that even Continuous Testing will not be enough. We need “Digital Testing” to achieve extra acceleration and meet the quality needs of future. AI can help us get there. If you keep pace with the market buzz you will find there is an ongoing debate about what AI can do? When it comes to testing, lot of theories have started predicting that AI has the ability to replace testing. Well personally I don’t see this happening in near future. But we certainly are very excited about capabilities AI present in from of us. a) Can it improve speed of current testing process? b) Can it help generate meaning full data for me to make intelligent decisions? c) Can it improve the test coverage and reduce cost? So, are you ready to adapt a personal assistant for testing. So are you ready to say? Certifaya, Can you run an App Test for me? 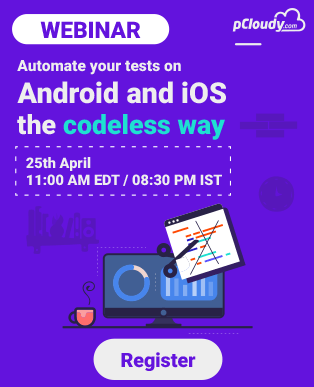 pCloudy’s AI powered bot, can automatically test the mobile applications over hundreds of real mobile devices and gives its users real time insights into the app’s behaviour and performance. Do you want to explore more? Try Certifaya for free now and testify it yourself. You can also go through our webinar on the same topic to understand it in detail. 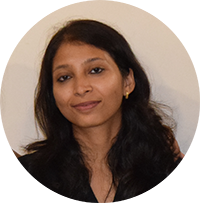 She is a Product Marketer with over 9 years of diversified experience across content, branding, and product marketing. Her experience ranges from global brands to nimble startups. She is a custodian of Brand & Content, telling stories about the brand that delights customers and provides compelling business value.